Your ATV isn't doing you much good during the winter. 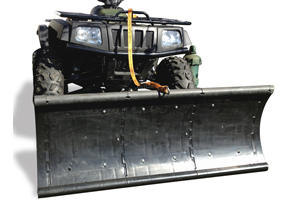 Why not put it to work with an ATV plow? Personal ATV plows are an infinitely better way to shovel than shoveling by hand. Not only is it faster but you save yourself from the unpleasant sensation of working up a sweat in the freezing cold. 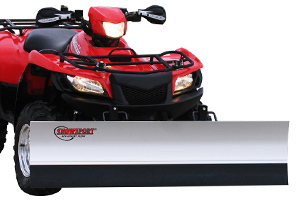 Our selection of specialty plows will let you put your ATV or UTV to use during the winter months. If you're looking for something you can use year-round, the plow can be used to push mulch and dirt around for gardening and yard work. Some customers even use their UTV plow to push water off tarps and pool covers. When you buy one of our specialty plows for your ATV, UTV, or riding lawnmower, we ship it to your door for free. And, if you need some help during the selection process, one of our customer service representatives will help you via livechat or phone. Our product specialists are in every day, and our number one priority is customer satisfaction. The same goes for your riding lawn mower too. 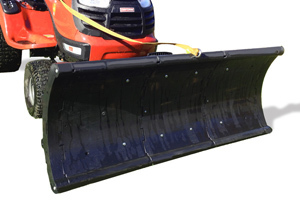 While you won't be doing much grass cutting in the winter months, you can use that same mower to push the snow off your driveway with the simple addition of a snow plow. Just one morning of plowing with your ATV or lawn mower will have you convinced - you'll never want to pick up the shovel again. 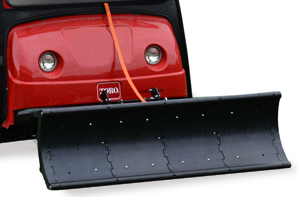 At Snow Plows Direct, we only offer the best in he business too. And each of our plow pages includes high-res pictures, real-world customer reviews, and a complete list of what you can expect when you open the box. Plus, as always, our shipping is 100% free of charge, and we'll price match your order for an entire year after its made.